I have made another card - this time for christmas. Have used the sketch over at sketch saturday this week - week #123. 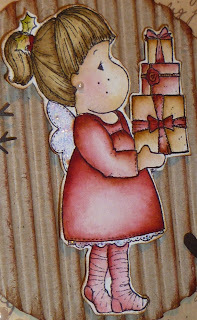 Am also joining challenge #79 at Stamptacular sunday - layer it on, and week 75 at Just Magnolia - Anything goes. Stamp is of course from Magnolia, colored with distress inks - mainly aged mahogany and vintage photo. Patterned papers I found in my folder of scraps. I believe the text-paper is from Papirdesign, but the other one I have no idea. Have also used lace and roses from papirloftet. Heart is a punch from EK success and branch is a McGill punch. Beautiful card! Very, very nice. Beautiful card!!! Love the cardboard background and your coloring is gorgeous!!! Beautiful Christmas card, Stine!! I really need to start on mine, Christmas will be here before we know it... Hugs!! Beautiful card! I love your choice of rich, vintage colors. Thank you for sharing your "layers" of creativity with us over at Stamptacular Sunday Challenge! Hi dear! I have been BAD at blogging for awhile but trying to get to some while my big kids are watching some shows and my littlest is sleeping! Ok so anyways...LOVE the card! oh geez, it is SO sweet!!!! Åh for et fantastisk nydelig julekort Stine!! Å bruke bølgepapp slik var genialt altså!